If you have ever had lump behind ear, along with pain or swelling, you know how uncomfortable it can be. Many people think it is nothing to be concerned about, but it is important to understand the reason for a swollen lump behind ear, because while some cases can be minor, others are more serious. Both painless and painful lumps can be small or large, and they can disappear over a few days or weeks without any need for medical attention. If you notice an annoying lump behind one of your ears for more than four weeks, you should consider seeing a doctor. Allergic reactions can cause lumps and swelling behind the ear or it could be a cyst that needs to be removed. It could also be something more sinister. The symptoms will depend on what is causing the problem and whether or not the lump has become inflamed or disturbed in any way. For example, if you scratch it to the point where it bleeds, it could become infected, which makes it much worse. Although statistics are not available, we do know that cysts behind the ear are rather common. The symptoms of a cyst behind ear listed below give you a sense of what it is like to have such a mass. If you have a history of acne, it will likely be easy to identify lumps behind the ears and quickly realize that there is nothing to worry about. For others, trying to figure out what the lump is may be a little harder. When doing a self-check, ask yourself, does the lump feels soft? If it does, then it could be a cyst or fatty tissue. Ask yourself, is the spot tender and painful when I touch it? In cases where a person feels slight pain, it is often a pimple or an abscess forming. Of course, you will want to take note of any other symptoms such as fever or chills. As stated above, a lump behind the ear can be painful or painless. So what is the cause of that lump? First, let’s look at the potential reasons for an unpleasant painless bump forming. You are about to discover that just because something is painless doesn’t mean that it should be ignored. Sebaceous cysts – These are noncancerous lumps that develop around the sebaceous gland responsible for producing oil. Lipoma – A fatty lump that can develop between the layers of our skin. Although harmless, it can grow large. Benign tumors – These are soft, movable lumps that develop from salivary gland tissues to the parts behind the ears. Although painless, there is one form called cholesteatoma that destroys tissues near it and can lead to hearing loss, drainage in the ear, and dizziness. Malignant cancer – Much like skin cancers, these lumps can grow behind the ears. They may be painless, but they grow larger over time and obviously need medical attention. Abscess – These are lumps that develop when tissue or cells become infected. Our bodies respond to the infection by sending white blood cells to the affected area. As a result, pus begins to develop in a lumpy form. Abscesses are warm and painful when touched. Dermatitis – This takes place when waxy dead skin cells or dry skin builds up and is joined by inflammation and redness. Stress, fatigue, yeast infections, and neurological conditions can cause dermatitis. Mastoiditis – The mastoid bone is found behind the ear and can get infected. It can lead to swelling and the formation of lumps behind the ear. Fever, headache, and hearing loss are some of the symptoms. Swollen lymph nodes – When lymph nodes swell, they can cause small lumps behind the ears that are tender, soft, and painful. Often, it is associated with other health issues such as strep throat, viral sinusitis, bacterial sinusitis, or even the common cold. Acne – Pimples on the surface of the skin, including behind the ears. It can be caused by hormonal changes and high levels of staph infections or stress. As well, some people are genetically predisposed to acne. Otitis media – This is the official term for an ear infection. An ear infection can result in swelling behind the ear. There are some causes of lump behind the ear that can be painful or painless. For example, a throat infection and mononucleosis, also referred to as Epstein-Barr virus, can lead to swelling around the neck area. HIV/AIDS, measles, and the chickenpox can also cause swelling around the face and neck. When it comes to cysts behind the ear, they can be caused by allergies, infections, bone tumors, or other forms of cancer. The majority of cysts are not serious, but some are a sign of a more complicated health problem such as cancer. For instance, salivary gland cancer or skin cancer can grow as malignant cells behind the ear. Difficulty swallowing and a sore throat that does not heal could be a sign of salivary gland cancer. Swollen lymph nodes that start as bumps in the back of the ear could be a sign of leukemia and lymphoma. 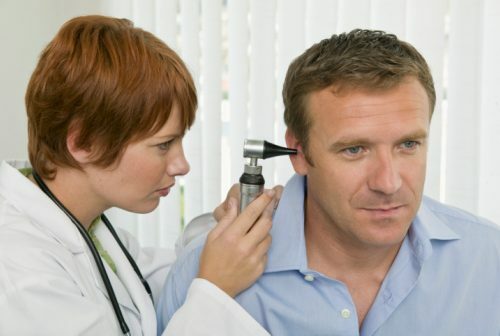 Complications can occur as a result of lumps behind ear. Ear lumps caused by cancer can be life-threatening. Of course, it depends on the type and stage of cancer. If untreated, ear lumps can lead to widespread infection in the body. You can avoid complications such as ear infection, hearing loss, widespread infection, and widespread cancer by seeking medical attention and following recommended treatment plans. If otitis media spreads out of the middle ear, mastoiditis can form, which can cause severe headaches and hearing loss. Although rare, otitis media on its own has been known to cause facial paralysis in some cases. Equally concerning is choesteatoma, the abnormal collection of skin cells inside the ear that can develop due to reoccurring middle ear infections. When choesteatoma is not treated properly, it can damage the inside of the ear and has the potential to lead to hearing loss, weakness in the face, dizziness, and a horrible sensation whereby the sufferer hears sounds from inside their body rather than from outside sources. Another complication known as labyrinthitis, which is also linked to ear infection, can cause vertigo – the feeling that the environment around you is spinning. Most of us have heard of meningitis. It can occur if the middle ear infection spreads to the outer layer of the brain and spinal cord. Fever, stiff neck, rapid breathing, sensitivity to light, and severe headaches can be symptoms of meningitis. Just as serious a complication of the middle ear is a brain abscess. This is a pus-filled swelling inside the brain. It makes a person confused and weak, it can lead to seizures, a high temperature, and even paralysis on one side of the body. If you suspect meningitis or brain abscess, call for emergency assistance immediately. As you can tell, it can be difficult to determine whether a small lump behind the ear is going to be a real health issue or not. A lump behind the ear can impact different locations. A small lump just below the ear is often called “pea-sized”. For many people, it is an odd-looking nodule that shows up on the ear bone. These pea-sized lumps behind the ears can be fleshy, fatty cysts or a more serious growth such as a tumor. A cyst can appear behind the ear, in the ear, in the earlobe and even on the scalp. In the vast majority of cases, they turn out to be pimples. A hard lump on the ear bone can cause some discomfort and may seem odd to the person who has it because it is moveable. If you touch it with your finger, it will slide underneath the skin. They are often diagnosed as lipomas (fatty lumps) and are common noncancerous growths that can also appear on legs, wrists, or the skull bone. A lump behind the ear after piercing is not uncommon, especially in cases where the piercing becomes infected. Bacterial infections on piercings lead to the formation of ear bumps and cysts, but the good news is, they can be treated. When a child has a cyst behind his or her ear, parents can get very worried. It doesn’t spell doom and gloom though. A pea-sized cyst on an infant can be present at birth and cause no real problems. Should a cyst become infected or painful, it can be removed through a simple surgical procedure. This may sound strange, but cysts behblood pressure chartind the ears can smell. The soft lump behind the ear is often due to skin pores becoming clogged with oil secreted from the sebaceous glands. The cysts can expel puss that has an odor, or when infected the cyst can begin to produce a foul smell. Many people who discover a lump behind the ear feel the urge to break it by squeezing it with their fingers or popping it with a needle. It is better to see a doctor for a proper diagnosis. If you squeeze a lump behind the ear lobe, you could increase your risk of infection and delay the healing process. You could also end up causing yourself more pain. 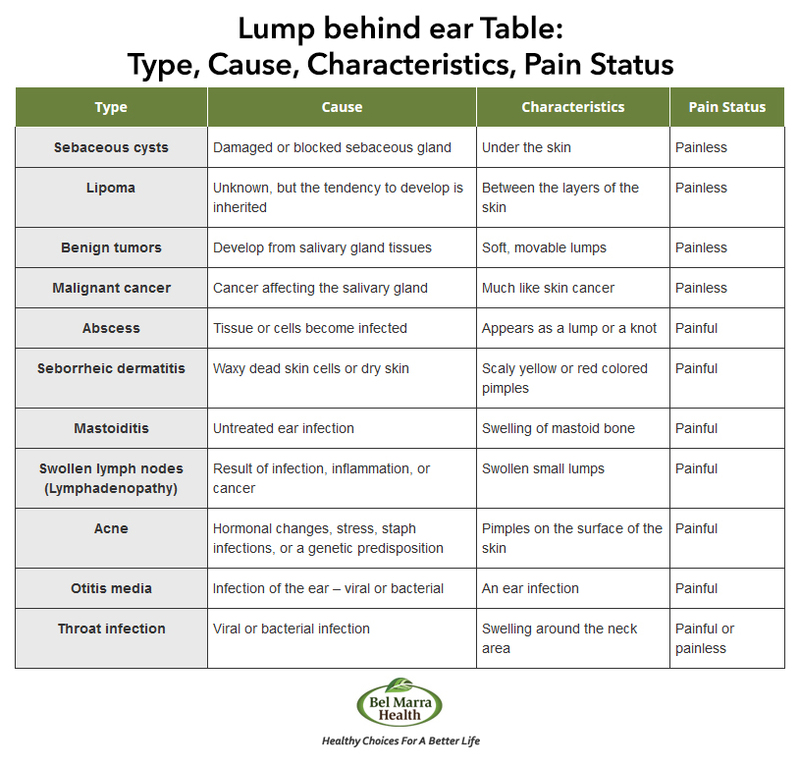 It is worth noting that recurring lump behind the ear could be an indication of a health risk or an infection. When the cyst behind your ear keeps coming back months or years after healing, you really should see a doctor. So if you have a bump, you are likely wondering, what are the different treatments for painful lumps behind ear? Well, since the cause determines the treatment, once the diagnosis is clear, proper care can begin. Abscess – Some abscess cases require simple draining to remove pus, while others are more complicated and may need to be addressed with surgery. Surgical procedures are more likely to include antibiotics due to the chances of infection. Sebaceous cysts – Sebaceous glands produce oil and sometimes get blocked, thus creating cysts. Most do not require any treatment, but if they cause tenderness or swelling, a warm compress can help. If a cyst really bothers you, seek medical advice. Acne – Most cases can be treated with topical remedies, but for some people acne can be severe and can require specific approaches applied and monitored by a dermatologist. Dermatitis – Lotions or creams are often recommended to help with the itching and discomfort. Antifungal agents may also be suggested if there is a yeast infection. Taking a soothing bath with Epsom salts or baking soda and uncooked oatmeal can be comforting, too. Swollen lymph nodes – In this case, the underlying cause of the swelling is treated. This could mean antibiotics, or a biopsy may be needed. Mastoiditis – This is immediately treated with antibiotics and, in some situations, a procedure is needed to drain the middle ear or take out some of the bony mastoid. Otitis media – This infection of the middle ear often clears up on its own within 48 hours. With recurring otitis media, an ear tube is used to drain fluid from the middle ear. Benign tumor – Since usually it isn’t a health threat, it is normally not treated unless, of course, someone wants the tumor removed for cosmetic reasons. Then a surgical procedure will be performed and a course of medication will likely be recommended to help the patient deal with possible infection and pain following surgery. Malignant cancer – These growths can be treated with chemotherapy or radiation. Specific treatment depends on which type of cancer it is and what stage it is. Most treatments are not as scary as people think. If anything, it is a little inconvenient. Most dermatologists will tell you that the worst you can do is squeeze a lump yourself in an effort to get rid of it. It is best to discuss treatments of lumps behind ear with a qualified physician before deciding how to proceed. There are some home remedies that can bring a lot of relief when applied to those who are feeling uncomfortable. As mentioned earlier, a warm compress can sometimes help with cysts. It allows the cyst to be reabsorbed by the body so that the lump gradually shrinks. Topical lotions such as aloe vera or tea tree oil can also be comforting on cysts. When it comes to middle ear infections, doctors often prescribe antibiotics, but some people have also found that a mixture of strained olive oil and garlic oil that is boiled for about ten minutes and then cooled can be dropped into the infected ear with good results. After putting the drops in the ear, lean to the side and allow the liquid to drain out. With swollen lymph nodes, massaging heated castor oil into the glands has been known to bring relief. Or, a mixture of mineral oil or petroleum jelly with diluted lavender has also been suggested. While many lumps do go away on their own or can be treated easily at home, lumps that are stubborn, painful, recurring, or lead to infection and fever really should be looked at by a doctor. While dermatologists don’t want precaution calls on lump behind ear to scare people, they also want to emphasize the importance of not taking matters into your own hands when a growth behind the ear is irritating and doesn’t appear to be going away on its own. As the old adage goes, “it is better to be safe than sorry,” so squeezing, scratching, and popping the lump with a needle or simply ignoring it for months on end is not a good idea. If a lump is making you uncomfortable, causing you pain, or if you notice other symptoms that you can’t explain, seek medical attention.